Podcast Episode 33: Being a Werewolf Isn’t a Curse! 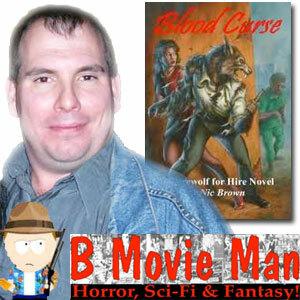 Nic Brown, author of Blood Curse, the first book in the Werewolf for Hire series of paranormal detective books, is also the creator of the B Movie Man website. During the podcast we chat about his books, werewolf rules, how being a werewolf can help you as a detective, favorite werewolf movies, American versions of British TV shows, B movies, becoming a better writer, the formula for a SyFy film, and more. A 2002 British horror film set in the highlands of Scotland. Soldiers on a military exercise are attacked by werewolves. Written an directed by Neil Marshall (The Descent, Doomsday), the film stars Kevin McKidd (Journeyman, Percy Jackson & the Olympians: The Lightning Thief), Sean Pertwee (the third Doctor in Doctor Who) and Liam Cunningham (First Knight, Clash of the Titans – 2010). Starring Claude Rains, Warren William and Lon Chaney Jr.
Two American tourists in Britain are attacked by a werewolf that none of the locals will admit exists. Three unlikely roomates — a werewolf, vampire and ghost — try to fit in with humans while dealing with their inner (and outer) monsters. 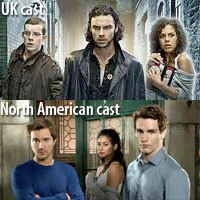 The BBC version, created by Toby Whitehouse, started in 2008 and stars Russell Tovey as George the reluctant werewolf, Lenora Crichlow as Annie the ghost, and Aidan Turner as Mitchell the vampire. The first two season were set in Totterdown, Bristol and the third season relocated to Barry Island, Wales. The North American version, produced in Montreal, started this year on SyFy in the US and Space in Canada and stars Sam Witwer as Aidan the vampire, Meaghan as Sally the ghost, and Sam Huntington as Josh the werewolf. It is set in Boston. Produced by the BBC, Doctor Who has been going, off and on, since 1963. It is listed in the Guinness World Records as the longest-running science fiction television show in the world, and as the “most successful” science fiction series of all time, in terms of its overall broadcast ratings, DVD and book sales, iTunes traffic, and “illegal downloads”. The series centers on a mysterious and eccentric alien known only as the Doctor who travels through time in a TARDIS (Time And Relative Dimensions In Space) that looks, on the outside, like a 1950s British police box. The Doctor has been played by eleven actors, the explanation being that periodically the Doctor needs to regenerate, taking on a new body and, to some degree, a new personality. Director and producer Michael Bay is best known for directing high-budget action films such as The Rock, Armageddon, Pearl Harbor and, of course, the Transformers series now coming out with the third film. He got his start directing commercials and music videos, including “I Touch Myself” by the Divinyls and “Soldier of Love” by Donny Osmond. Written and directed by Michael Worth (Demon Hunter, Sasquatch Mountain), God’s Ears is about a boxer with autism who meets and dancer and falls in love. Michael stars as Noah, and Margo Farley (Cloverfield, War Wolves) portrays Alexia, the dancer. John Saxon (From Dusk Till Dawn, A Nightmare on Elm Street), who is no stranger to genre film and television, is also in the film. Starring Eric Balfour (Haven, No Ordinary Family, Dinoshark), Donald Faison (Scrubs, Sabrina the Teenage Witch) and Scottie Thompson (Star Trek – 2009), Skyline is about an alien invasion. Directed by Craig R. Baxley and starring Joanna Pacula, Micahel Biehn and John de Lancie, this made for TV film is a throw back to film noir detective films. Joe Keyes (Biehn) is a private detective who gets caught up in a strange mystery involving alien nanites when a beautiful blonde comes into is office with a request to help protect her and her daughter from an obsessed scientist (de Lancie). A 25-year veteran in the Hollywood exploitation field, including such “classics” as Chopping Mall, Deathstalker II, Not of this Earth, The Return of the Swamp Thing, Dinosaur Island and Dinocroc vs. Supergator.